VICTORIA, BRITISH COLUMBIA--(Marketwire - Oct. 21, 2010) - Following the successful redesign of the ACDSee professional photography workflow software last year, ACD Systems International Inc. has sets its sights on expanding the application's fast and flexible capabilities even further with the launch today of the beta test version of ACDSee™ Pro 4. Beta downloads are available to the public at www.acdseepro.com. The company expects thousands of professional photographers to participate in the ACDSee Pro 4 beta period and provide feedback in the development process, similar to the 10,000 testers who helped shape the current version. "The top themes we continuously hear from our users during beta tests revolve around saving time and customizing workflow, so those will again be top priorities for Pro 4," said Cam Carmichael, product manager for ACD Systems. "Beta testing is the best way to gather feedback to make sure we are continuing to deliver on our promise of a fast and flexible workflow tool at a tremendous value." New, workflow-accelerating tools for viewing and managing metadata. New map view available in both Manage and View mode. 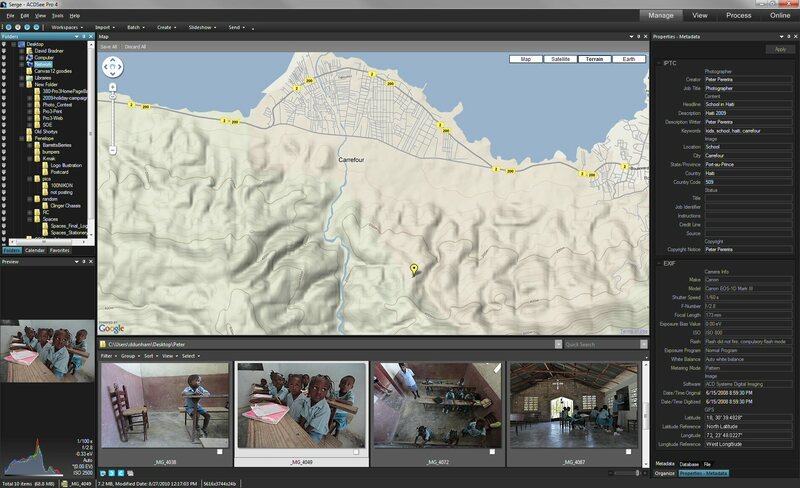 Map view enables users to easily geotag items, view items on the map, use the map to select groups of files for further workflow steps and use the map to select images for display in View mode. Wider color space for best possible color preservation. Improved performance and usability enhancements. Chromatic aberration correction and defringing. ACDSee Pro 4 beta testing is available at www.acdseepro.com. Headquartered in British Columbia since 1993, ACD Systems International Inc. is one of the world's leading developers and marketers of digital imaging software, including the renowned ACDSee image management tool and Canvas, an advanced technical illustration and graphics program. ACD Systems has millions of consumer and business users and more than 33,000 corporate customers, including many Fortune 500 companies. For further details, please visit www.acdsee.com. ACD and ACDSee are trademarks of ACD Systems International Inc. and may be registered in Canada, the United States, the European Union, Japan or certain other jurisdictions. Canvas is a trademark of ACD Systems of America, Inc. and may be registered in certain jurisdictions. Trademarks of ACD Systems of America, Inc. are used under license by ACD Systems International Inc. or its subsidiaries. CMD Agency for ACD Systems International Inc.
About this company ACD Systems International Inc.